Observation - UNKNOWN SPIDER - UK and Ireland. 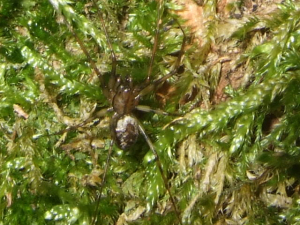 Description: DARK SPIDER WITH GREY AND BLACK BANDED LEGS AND WHITE PATCH ON BACK,FOUND ON MOSSY WELL CREVICED OAK TREE. DARK SPIDER WITH GREY AND BLACK BANDED LEGS AND WHITE PATCH ON BACK,FOUND ON MOSSY WELL CREVICED OAK TREE.